One of my favorite pies has always been banana cream pie, but Nick couldn’t eat it due to the egg in the meringue. I decided I needed to create my own version and added it to my list of egg free recipes. 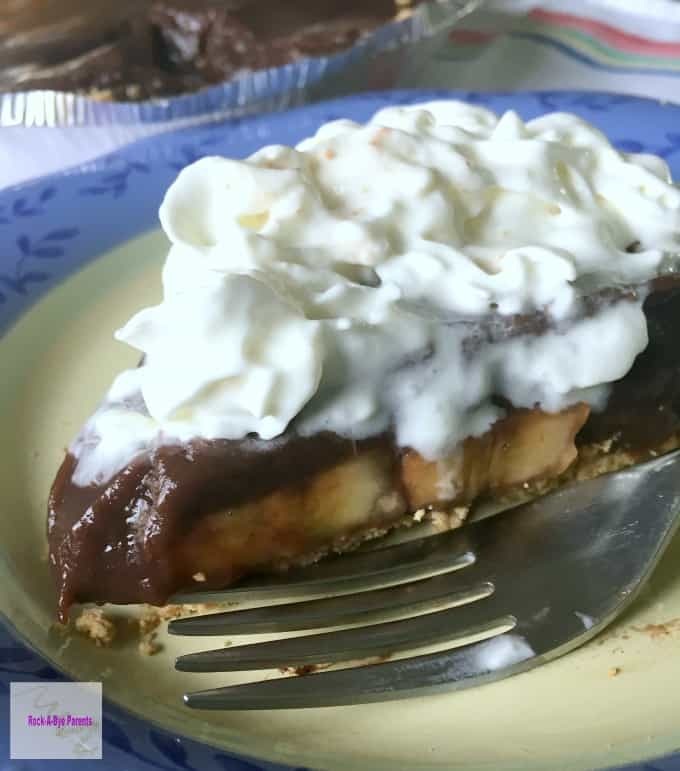 I changed things up by making it an egg free chocolate banana cream pie! Our family has always loved pies that have meringue on them, and banana cream pie was one that has always been made a lot. Of course it’s a great recipe to make when you have ripe bananas that you need to use up. As much as I love traditional banana cream pie I thought it would be fun to change things up a bit since I needed to modify the recipe to make it egg free anyways. 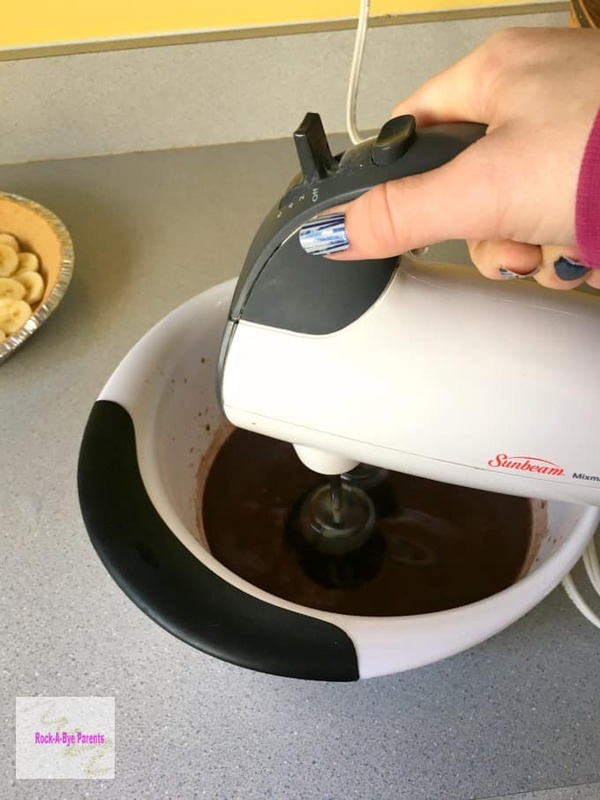 We’re really big chocolate fans in this house, so making the recipe an egg free chocolate banana cream pie seemed like a great recipe to create. I originally created this recipe with a regular roll out pie crust. I recently made it again though with the graham cracker crust, and what a difference it made. This pie is yummy with the regular crust, but it is amazing with the graham cracker crust! I was blown away by the flavor change. The graham cracker crust just adds so much to the recipe! One thing I love about this recipe is how easy it is to make. It doesn’t take all that much time to make either, which is always a plus in my book! The first thing you’ll need to do is to slice up the bananas. As you slice them up lay them on the bottom of the crust. It’s easiest if you start at a side and wrap your way in. Once the entire bottom of the crust is covered place the remaining slices on top of the first layer. When I do this I first place those pieces in areas that have larger gaps between the banana pieces. 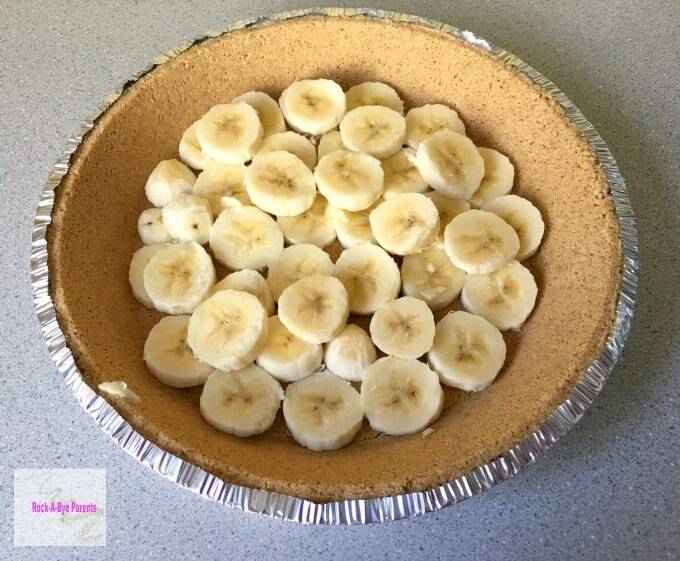 The idea is to have every part of the bottom of the pie crust covered with a banana layer. 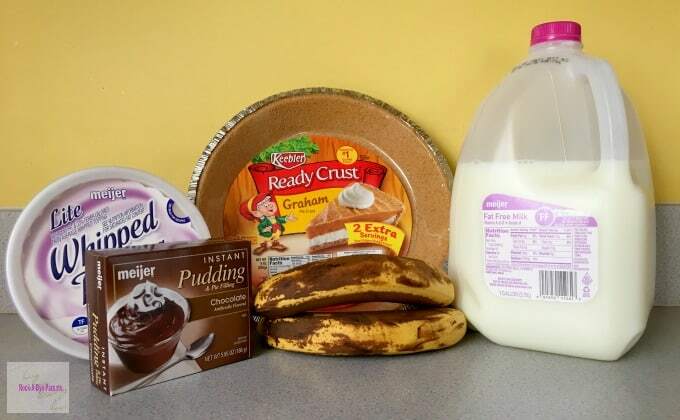 Once you have both bananas sliced and layered in the pie crust it’s time to make the pudding. For this just follow the directions on the pudding box. You’ll want to look at the amount of milk and mixing time necessary for pie filling as it is different from the amount if you’re just making the pudding to eat on its own. When the pudding is all made per the box instructions all you have left to do is to pour the pudding into the pie crust and then place the pie in the refrigerator! You’ll want to leave the pie in there for at least a few hours. It’s even better if you can leave it in the fridge overnight though. That really gives the pudding time to set. To finish the pie you’ll want to add whipped topping to the top of the pie when it’s time to serve it. The easiest way to do this is by putting the topping on after you have cut the pie into pieces and placed the slices on the plates. Then all you have left to do is enjoy it! 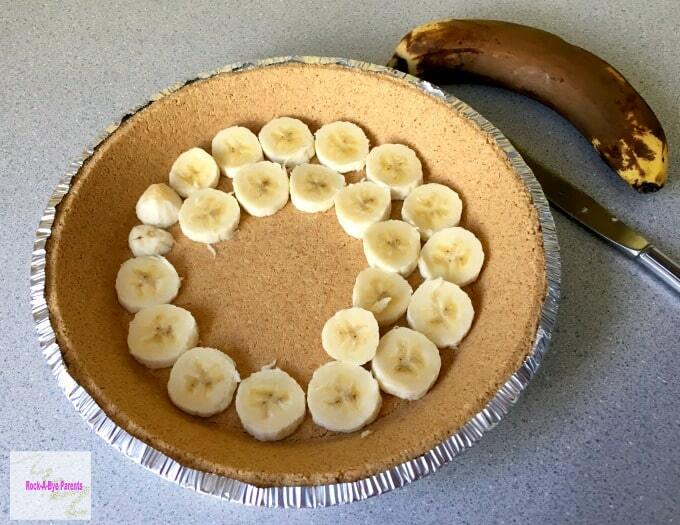 Slice the bananas and lay them on the bottom of the crust. You want them to be as close together as you can get them and you should have two layers of them. Follow the instructions on the pudding boxes to make the pudding. Pour the pudding mixture on top of the bananas. Put the pie in the refrigerator to set for a few hours. Leaving it overnight is best. When it's time to serve the pie top the slices with whipped topping. This looks like such a yummy dessert. It really is! It has become one of my favorites. This pie looks so yummy! My family would love this. This recipe sounds amazing and one I must try and soon thanks so much for sharing this one. This recipe looks so good! Banana Creme Pie is my absolute favorite. I like that it’s egg free too. I am a sucker for chocolate with bananas or chocolate with anything for that matter and this looks so easy and good! I’m a major sucker for chocolate too. I can pass up a lot of sweet things, but it’s really difficult if it in anyway includes chocolate! Looks delicious. The picture is tempting. It is very great to pin in the Pintastic Pinteresting Party. Thank you for sharing. Looks great.Thanks for linking up at Sweet and Savoury Sunday, stop by and link up again this weekend! I love pudding pies! Thanks for linking up with the Tasty Tuesday’s Link-up. I have pinned your post to the Tasty’s Tuesday’s Pinterest Board! I can’t wait to try this recipe – we have egg allergies and finding recipes without eggs can be a bit challenging. 🙂 Thanks for the great post and have a wonderful rest of your week! Pinning and printing! This would be a hit at my house. Hello! I saw your linky on Think Pink Sundays at the Flamingo Toes blog, and thought I’d stop by to say hi! LOVE your blog! That sounds yummy! I’ve never had this before, but it looks and sounds wonderful! Can’t wait to give it a try! We don’t eat the yolks of eggs at my house, so this could be interesting. Looks delicious. This sounds soooooo good! We love cream pies in this house but I never make them! Thanks so much for stopping by and sharing on Family Friday Link-Up Party!!! I have to admit that I don’t make pies a whole lot either. They can be pretty time consuming. This looks SO delicious thanks for the recipe!! You’re very welcome Angie. I hope you enjoy it! Found you while partying at the Saturday Show off party. Those flavors are great together. You really can’t go wrong with them. Looks yummy! Thanks so much for your visit!! It is really yummy. 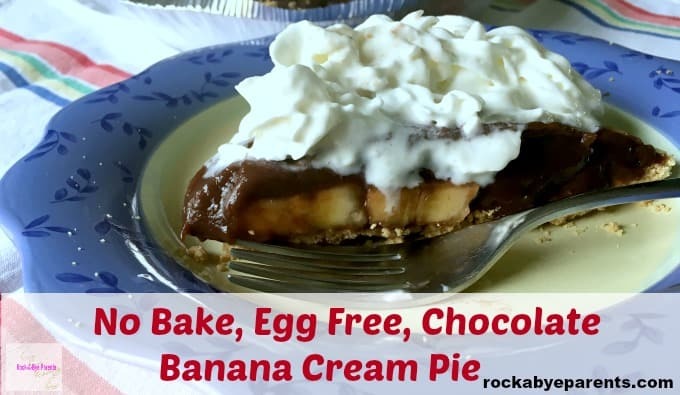 I like even better than regular Banana Cream Pie, although I do miss the meringue. This good so good! I love banana cream anything! 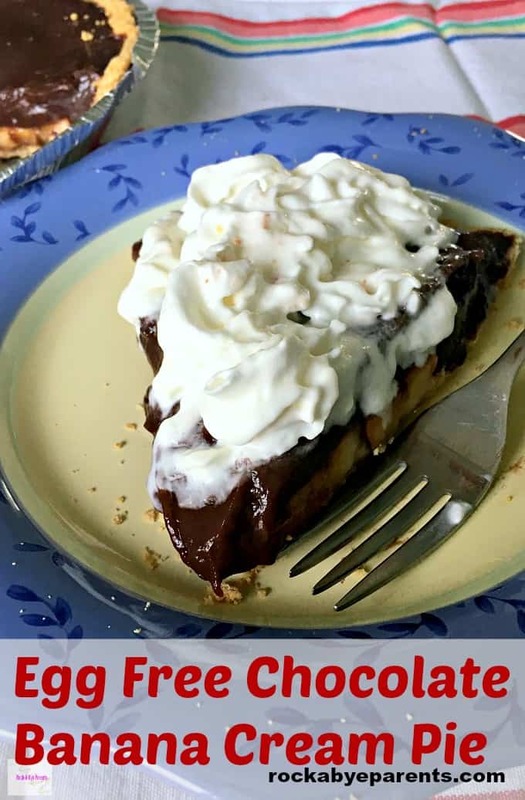 I’ve never had banana cream pie with chocolate – I feel like I’m missing out!